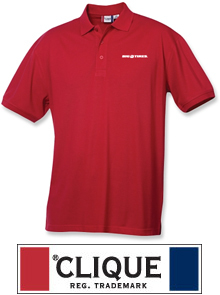 By Clique Apparel this updated polo comes with a three-button placket, knit collar and cuffs, and side vents. Treated with special 3M? stain repel and release finish. Fabric: 60% cotton and 40% polyester piqué knit; Weight: 5.6 oz; Left Chest Embroidery of Big O Tires logo. Production time for this item is 2-3 business days and, is made custom to order.